Readers unfamiliar with Hayter's cheerfully quirky voice from her Robin Hudson mysteries might still get a clue as to what's in store for them by the title of her new novel, a cheeky play on that of the William Burroughs classic. But instead of junkies, Hayter writes about another New York City minority, werewolves. Or, as some of them like to refer to themselves, people with Lycanthropic Metamorphic Disorder (LMD). To be honest, while Hayter does spend a fair amount of time with her werewolves, in both human and wolf shape, and posits a number of considered speculations on their genetic make-up and history, I'd say she's more interested in writing a character-driven novel that just happens to also have some werewolves in it. She spends as much, if not more, time delving into the psyches of Sam Deverell, a good-hearted if somewhat dim reporter at a local TV network, and his co-workers. Deverell is going through a bad patch with his marriage. So is the city's mayor, as well as the psychiatrist/werewolf Marcho Potenza, who runs a clinic for werewolves. Come to think of it, relationships on the edge of break-up, or those that have already disintegrated, touch pretty much all the characters in this book, from Annie Engel, the nicest girl in the city who, as the book opens, learns that she's a werewolf, to Jim Valiente, Potenza's rival, a renegade werewolf who was presumed dead. But none of this is delivered with teariness and angst. Hayter's trademark wiseacre voice is in full-throttle here as she pokes fun at social climbers, gossip columnists, news agencies, multi-national conglomerates, and anything else that happens to get in her way. What's surprising, and also so satisfying, is that all of this is icing on a great, fast-paced plot with characters we can really care about. Hayter has been, in her time, a news reporter, a TV producer, and a stand-up comedienne, but what she proves with Naked Brunch, as she has with her mystery series before it, is that first and foremost she's a novelist, smart and talented. I'm not sure what the attraction is in the Arabian Nights and stories of its ilk. For myself it combines a number of interests: folk and fairy tales, high adventure, and a fascinating, not to mention foreign, culture. And having spent a couple of my formative years in the Middle East, I find the landscape very familiar and somewhat missed, living as I do in North America's Eastern woodlands. Daniel Horch's first novel plays into all of this with the added bonus of delving into the history and practice of alchemy, another subject that intrigues me, but of which I know very little. The Angel with One Hundred Wings is set in ancient Baghdad and tells the story of Abulhassan Ibn Thaher, an old pharmacist and alchemist who is also a confidante of the sultan. Having raised himself and his family from small village poverty to their present comfortable position in society, he's hardly interested in jeopardizing it by helping the prince of Persia elope with Schemselnihar, the most loved of the sultan's harem. But what he wants and what fate has in store for him aren't necessarily the same thing and he soon finds himself deeply embroiled in the young lovers' affairs, with the danger of discovery escalating by the day, and certain death waiting as his reward. Horch brings ninth century Baghdad beautifully to life, writing in a style that makes it easy for contemporary readers to slip into this ancient world, with an assurance that makes you feel he's relating his story from firsthand experience. There is none of the overt magic of the Arabian Nights to be found here, but the sensuous and dangerous world of djinns and magic still feels close. And while the events that move the plot forward center around the sultan, his mistress, and the Persian prince, in the end, the book is really about Abulhassan himself: his hopes and fears; his study of alchemy and his growing distance from his family; his affection for the sultan, not to mention his guilt at betraying his friend and how, by doing so, he is also putting his whole family in danger. In fact, asked for a quick, catch-all phrase to describe the book, I'd have to say it's a septuagenarian coming-of-age novel, if that's not a contradiction of terms. What Abulhassan ends up learning, the closer he comes to his own death, is the importance of life, the importance of what he does have. Recent events aren't jeopardizing the most crucial elements of his life. That has already happened through his own inability to live in his own life. In The Angel with A Hundred Wings Horch has a produced a beautiful and many-layered novel. The Internet's an interesting place, though I don't know where people find the time to surf it as much as they do. Perhaps they're simply better at managing their time than I am. They certainly seem to have more of it to spare. I tend to go directly to a site I want, looking for some specific information. If a search engine brings me somewhere that's not exactly what I need, I don't spare the site much more than a glance and move on. But occasionally I'll go browsing and will even be delighted in what I find. It's about the "illegal" downloading of MP3s and also touches on the downloading of e-books. I put "illegal" in quotes because Ian makes a good argument that these downloads are actually boosting sales for musicians and writers, rather than stealing income from them. From Ian's article, I was led to the Baen Free Library (the url is listed above) and read yet another fascinating take on the subject--this time from a writer's point of view--in Eric Flint's introductory essay to the site. He reiterates a number of Ian's arguments, and then goes on to equate the availability of books offered for free in e-versions to be not much different from the way we lend books to our friends, or get them from a public library. "I don't know any author," he writes, "other than a few who are--to speak bluntly--cretins, who hears about people lending his or her books to their friends, or checking them out of a library, with anything other than pleasure. Because they understand full well that, in the long run, what maintains and (especially) expands a writer's audience base is that mysterious magic we call: word of mouth." Then he goes on to tell us, "And, just as important--perhaps most important of all--free books are the way an audience is built in the first place. How many people who are low on cash and for that reason depend on libraries or personal loans later rise on the economic ladder and then buy books by the very authors they came to love when they were borrowing books?" And here's one last telling remark. He talks about how at the present time, reading off a screen is not as competitive as reading paper. But what about the future when "advances in technology might make piracy so easy and ubiquitous that the income of authors really gets jeopardized?" To this he shares "a simple truth which Jim Baen is fond of pointing out: most people would rather be honest than dishonest." Then he goes on to say, "The only time that mass scale petty thievery becomes a problem is when the perception spreads, among broad layers of the population, that a given product is priced artificially high due to monopolistic practices and/or draconian legislation designed to protect those practices. But so long as the 'gap' between the price of a legal product and a stolen one remains both small and, in the eyes of most people, a legitimate cost rather than gouging, 99% of them will prefer the legal product." What's the point of all of this? Because, really, the pros and cons of free downloads is an argument that you'll probably have as much luck winning as you will answering the old question of "What is SF?". Well, right now at the Baen Free Library you have access to quite a large number of books, all of them free. These books have been previously published in regular paper editions and many of them are still in print. 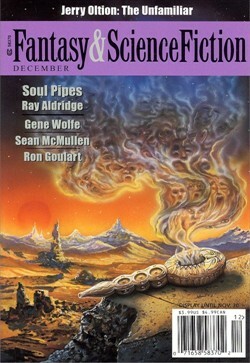 They're not by unknown authors (although that shouldn't put you off), but by established writers such as Flint himself, as well as Lois McMaster Bujold, Jerry Pournelle, Mercedes Lackey, David Webber, and Larry Niven. And the Baen Free Library isn't alone in this. If you have the time to go surfing, try other places such as Fictionwise (www.fictionwise.com) where you can also find free downloads to introduce you to authors you might not otherwise know. In other words, if you have access to a computer, go ahead and sample some of these books and stories. Read them on your computer screen or transfer them to a handheld. You can even print them out, though I don't know why you'd bother with that since the cost of all the paper you'd use would probably be more expensive than going out and picking up the a paperback version. Then, if you like what you've read and want to read more, prove Flint and Ian right: go out and buy some of the authors' other work. Let's prove that this is a method of promotion that can work.